A spirited competition can take the best fundraisers and make them even better. That’s what drove one nonprofit to raise over $4,800 during their 2016 Giving Tuesday campaign. Giving Tuesday is a global day of giving that follows Thanksgiving and the well-known shopping holidays, Black Friday and Cyber Monday. In 2017, it generated over 300 million dollars in online donations alone and over 1,000,000 social media mentions. It’s a great opportunity for organizations to make an extra push toward their year-end goals. Over the years, Neon nonprofits have come up with some excellent Giving Tuesday campaign ideas, and they’ve seen great results. To celebrate their past successes, we’re highlighting some of our favorite Giving Tuesday celebrations from members of the Neon community. Today, we’re featuring Wyoming Equality. John King had never heard of Giving Tuesday until he received a promotional email about it in 2016. King is the Board Chairman of Wyoming Equality, an activism nonprofit dedicated to achieving equity for Wyoming’s LGBTQ communities. During their first go at Giving Tuesday, King and his team set out to raise $5,000. Their strategy included personalized mail appeals, complete with branded return envelopes and a Facebook event page to increase awareness. Much to their delight, they were able to quickly surpass this goal, raising a little over $6,500 total. The Wyoming Equality team also decided to utilize Neon’s peer-to-peer fundraising capabilities to create a competition within their organization. The end-goal was to see who could raise the most funds. 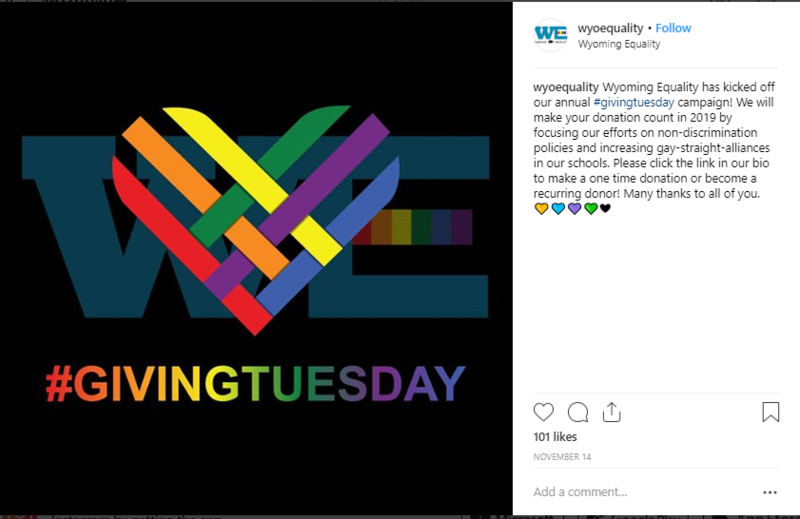 Wyoming Equality has celebrated Giving Tuesday every year since they began in 2016, raising over $15,000. This year, their Giving Tuesday campaign plan is focused on funding non-discrimination legislation in support of LGBTQ rights. We are very proud of everything Wyoming Equality has been able to accomplish with their Giving Tuesday campaigns. Want to see some of the features they mentioned in action? Check out our video demo. Just 15 minutes and you’ll see how our nonprofit CRM can help your organization make the maximum impact on Giving Tuesday and every day after that.